Summer is here and it is time to get outside and play! Did you know that physical literacy is just as important as reading literacy? Young children have to learn how to catch, throw, jump, and balance, just as they have to learn the alphabet and sounding out words. And we have to keep doing those things to be good at them! In order to make it easier for parents to help their kids learn physical literacy, we've partnered with Sport Nova Scotia and Department of Health & Wellness, Active Living Branch to create kits that you can take home and play with! Each kit contains fun items such as balls, juggling scarves, activity dice, frisbees, skipping ropes, and more! There's an activity booklet included in each one that guides you in ways to use the items included. We've even included 4 picture books that will get you moving as you read together. The kits are designed to increase physical literacy and to make it easy for you to be active. Our kits are modeled on kits that were originally developed in Kingston, ON. Each kit may be checked out for 3 weeks. All you need is your valid AVRL library card! We'll also have the kits in some of our branches this summer for you to explore.To learn more about the kits and about physical literacy, click HERE. Hantsport Library is moving! And we are excited! This week, our Hantsport branch library is moving from its location in the school to a newly renovated site at the former Legion Building at 10 Main St. We’ll be closed June 23rd-26th and will re-open on Saturday, the 27th at the new location, with a new name – the Isabel and Roy Jodrey Memorial Library. Some time ago, planned renovations in the school precipitated discussions on the future home of the public library. In July of 2013, Hantsport Town Council voted to move forward with a plan to re-locate the library from the school. A Library Advisory Committee was formed to look at options and recommend a new location. Once the former Legion site was chosen, the Save Hantsport Public Library (SHPL) was initiated to raise the required funds. With support of the Friends of the Hantsport Public Library, and commitment from the Town, and the SHPL Committee, the library’s future was determined, and the project launched. The SHPL held countless innovative fund-raisers and were untiring in their dedication to the cause. 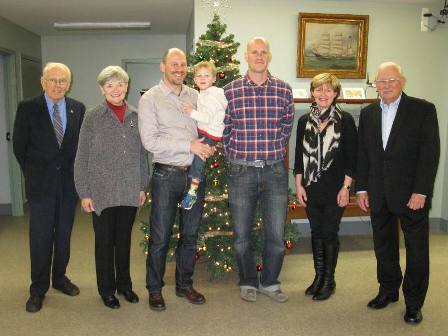 In 2014, members of the Jodrey family came forward to honour the late Isabel and Roy Jodrey with a $100,000 donation toward the project! The original target date for the public library to move from the school was August 1st, but, due to the school’s renovation schedule, we’re re-locating sooner than anticipated. Please bear with us as we work with some temporary shelving, furniture, etc. If you want to help make this new library even better, donations can be made HERE. The Isabel and Roy Jodrey Memorial Library will offer more convenient hours, a refreshed book stock, a lounge chair or two, and, later this summer, the public will enjoy an outdoor book return, available during non-open hours. We’ll have computer tech help during the summer months, and some great children’s programming. All services and programs are FREE. We hope you’ll come and see us at the new location. Remember: Summer Reading Club starts this week, too, so sign up at the Hantsport Library on the 27th or in the days thereafter. Summer Reading starts June 22! Summer time means fun in the sun, playing outdoors, and, we hope, time to read under your favourite tree. To encourage kids of all ages to read during the summer, the library hosts a Summer Reading Club each year. In order to reduce the “Summer Slide” that many students experience, we provide fun programs and incentives to keep kids reading and learning all summer long. This year, the club begins on June 22, and runs through August 22. We are excited to build programs and activities around this year’s theme, PLAY! Anyone 18 and under is invited to join our club, and read the summer away. Lots of your favourite activities are making a comeback this year. We are very pleased to partner once again with Upper Clements Parks to offer a free Fast Pass to everyone who completes the Summer Reading Club. When kids sign up, they will receive a booklet for tracking their READ and PLAY time. We have many fun activities on our booklet this year that families can enjoy together! Teens will read for 25 hours to earn their Fast Pass, and can enter for great gift card prizes for every 5 hours they read. We’ll also be returning to the zoo! Oaklawn Farm Zoo has generously agreed to host two Library Days at the Zoo. On Tuesday, July 21 and on Tuesday, August 11, if you are 18 or under you get in FREE to the zoo just by showing your AVRL library card. 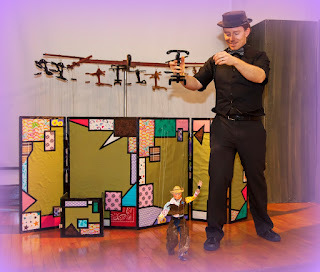 Our Bookmobile will be onsite and we’ll have lots of fun activities for kids those days, too. We’ve got a few special programs lined up, including Little Ray’s Reptiles, a Musical Zoo, and a Marionette Show from Montreal’s Panadream Theatre. We’ll have our Book Give Away Days, made possible in part by Adopt a Library. Chirpy, our little owl friend, is ready to travel. Send us a picture of Chirpy and you could win some great prizes! Our travelling Maker Labs have been refreshed, and we’ve got some fun robotics toys to play with, too. The C@P youth are back and they’ll host a wide variety of technology programs. Our branches are planning plenty of fun programs and activities so check our Calendar of Events to see what’s going on at your local library. The Bookmobile serves some of the Annapolis Valley's outlying communities and neighborhoods, aiming at all ages and interests. The Bookmobile provides access to a wide variety of adult and children's fiction and non-fiction material. You can also find magazines, audio books, and DVDs on the shelves. Our new Bookmobile offers an exciting library adventure. Based on statistics we have developed stops in community hub locations. We look for community meeting places and develop partnerships to offer mobile library service. Our current community stops vary from one to three hours in length. And we visit communities every three weeks. 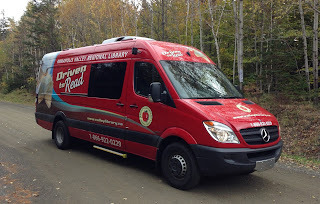 Our Bookmobile already offers mobile library service to Springfield, Summerville, Wilmot, Aylesford, Baxter’s Harbour, Centreville, Coldbrook, Maitland Bridge, Cornwallis and Bear River. The exciting news is that we have developed new partnerships to offer additional new community stops! Beginning this month we will offer Bookmobile service to East Dalhousie, Brooklyn, Black River, Hall’s Harbour, Port George, Morden, and Nictaux. To view our calendar of stops click here. This link will take you to the complete calendar of events for AVRL. You can filter these results by clicking on Outreach Services. Click on any Bookmobile stop to receive full information on location and time of stop. 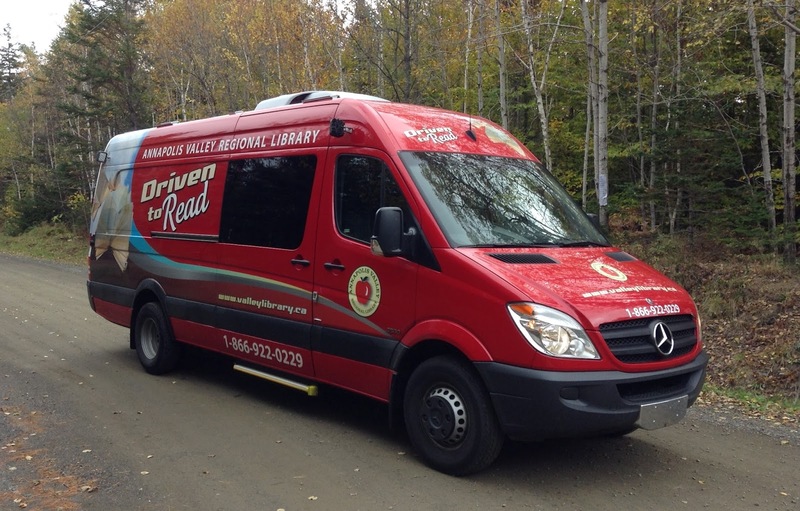 The Bookmobile can be seen travelling the Annapolis Valley almost daily. Bring a friend or neighbor and visit us at one of our community locations. Registering for a library card is FREE and can be used at any of our branches as well. If you see this lovely Bookmobile parked in your community, it probably means that we are open to the public. We will be flying a little flag to invite you into the Bookmobile. And please wave as you see us in your community. With the winter we have just experienced many of us are feeling used up, and sluggish. While we want to tackle the spring work we seem to be lacking the get up and go. The practice of taking a spring tonic is an old one; your grandparents may still have the recipes or have stories of having to force one down. If you are of a certain age you may have fond memories of Granny making and taking her “spring tonic” on the television program Beverly Hillbillies. One of our co-workers who grew up in Kentucky remembers her grandmother insisting that everyone have a heaping serving of poke salad every Spring. It was a means to purify and energize the body from a winter of being indoors with a diet heavy in meats and root vegetables. What went into the spring tonics of decades ago? Dandelion greens, nettle and burdock were popular ingredients. Another type was sulphur and molasses. Many were mixed with alcohol as a base. Keep in mind these were only supposed to be taken by the spoonful! Modern day tonics can be made from many easily obtained ingredients and you don’t have to be an herbalist to know what to use. They can taste a lot better as well. New greens are often at the markets and grocery stores. Honey, ginger, cider vinegar, lemon and springwater can be quickly put together as a quick tonic. 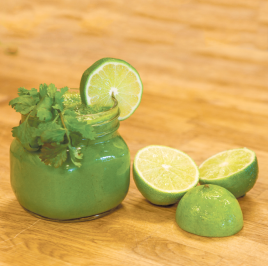 Your blender can take any number of greens and turn them into an enjoyable and energizing drink. Even a fresh, healthy green salad can boost your energy and serve as a tonic. Here’s an example of one of the many websites on the history of spring tonics. I also found this recipe that looks pretty good so I think it will be my tonic of choice this spring. Cheers!